It’s 2002 and I’m finding my bearings having a radio show and developing my taste for music. 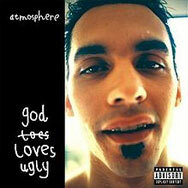 Atmosphere emerges as a mid-west rapper who’s pretty emo. His album is very well-received among white people, being released by a punk label and all. I like it. It caught some angsty parts of me and highlighted them pretty well. I say angsty when I mean emotional torments that don’t really matter all that much when you really look at where I was in life. There was one song that I loved, but could never really relate to. It was about a drunk party guy who always screws over women, created by clips of voicemails and a mean beat. I’ve gotten calls where people think I treat them crappy or yell at me to feel better. That’s going to happen, I guess. At the time, I wasn’t very experienced in getting the girl, but I did have my eye on one. She was sweet and even kind enough to listen to my radio show when she would teach dance to little kids. That was a really sweet gesture that I appreciated, though I didn’t see how nice it was at the time. Sometimes it takes distance to realize how kind someone is. In the present you might be suspicious, passive, expecting, or even demanding of kindness, but when you look back on things– well, all of those ways you were could be more intense, but they could be totally different, too. In this case, she was nice to me, and I was nice to her, but one show she heard this song– the one below, fully edited– and told me to not play such offensive music. It wasn’t a rude reaction, but I knew I wanted to play this song almost every show after that. I did wait until her class was over and she wasn’t listening with kids, but I couldn’t escape how much I loved this song (maybe how much she made me love it by making it forbidden). I was a kid. Each person that tells me I’m mature doesn’t know the emotional and relationship development path I’m on– years behind where I should be. Professional behavior is even further behind. Sometimes our development gets shuffled and chopped up, but I can’t help but be enticed by the things I’m told I can’t (or shouldn’t) do. Not so much crack or murder, but music? For sure. When this song comes on (usually on random), I’m reminded of that girl and that time when I sort of slighted her request. It’s not something that keeps me up or eats away at me, but it’s something I think back on and wonder if I could’ve taken a small step to be gentler. It doesn’t matter now, so many years later, but it’s the sort of memory that makes me think I could do better today.